Is Christmas REALLY Coming Earlier? Each year, we're always surprised at how early retailers start Christmas preparations. Christmas trees in stores before Halloween? Crazy, right? When we were younger, retailers didn't even think about Christmas decorations until the day after Thanksgiving. We're sure of it. The origin of the term "Season Creep" can be traced back to a 1987 article in the Chicago Sun-Times. The article, which was about a man who took his role as Santa very seriously, stated, "And so does the culture, with a commercializing of himself that Santa deplores even as he has watched the holiday season creep back to Labor Day." However, the term "Season Creep," also known as "Christmas Creep," didn't come into mainstream use until around 2006, when an article linked it to global warming. A 2007 article extended the term to mean that as global warming changes the world around us, seasons in general are beginning to creep into each other. But as a recent Slate.com article pointed out, ads were encouraging shoppers to begin their Christmas shopping in October as early as 1912. Still, were Christmas decorations in stores before Halloween prior to the year 2000? I really don't remember. Does anyone else? Consumers have complained about early Christmas decorations, but that hasn't stopped retailers. I personally noticed the issue this year when an online friend posted a photo of herself, in Halloween costume, posing at the mall in front of a Christmas tree. 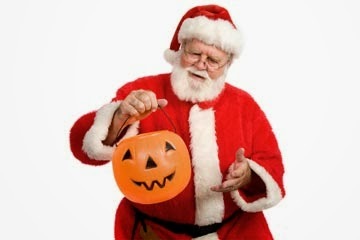 The malls encourage people to celebrate Halloween with them, but they greet those families with a blend of holidays that must seem a little bizarre. Then there's the issue of Christmas cards. Families wanting to have current pictures of their children with Santa need to get those pictures taken early. If malls wait until November 29 to start lining kids up to sit on Santa's lap, parents will be rushed to get cards made and in the mail. When combined with all the other stresses of the Christmas season, do parents need that stress, too? Still, consumers are very vocal about their dislike of Christmas Creep. In fact, one Canadian retailer was forced to remove its Christmas music when customers complained that November 2nd was too early to be hearing Jingle Bells. Is the problem getting worse? Maybe. But I know I've been hearing people complain about it since at least the early 00s.